What is RIP v1 ? What is RIP v2 ? What is the default routing update period for RIP ? What are 4 timers in RIP ? What two things will a router do when running a distance vector routing protocol ? 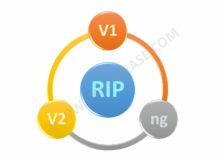 What is Difference between RIP v1 and RIP v2 ? What is the multicast address that RIP v2 uses ? What does RIP v2 use to prevent routing loops? Can RIP perform Load Balancing ? Please explain ? What is the administrative distance of RIP ? Is a subnet mask field available in a RIP v2 packet ? What are two characteristics of RIPv2? Which transport layer protocol does RIP use ? Which port number is associated with RIP ? If a static route and a RIP learnt route is available on a router which entry would be chosen by the router to forward the packet ? What is the major benefit of dynamic routing protocol like RIP over Static route ? What route entry will be assigned to dead or invalid route in case of RIP? Which command displays RIP routing updates ? RIPng uses broadcasts to exchange routes ? Kindly validate the statement. You type debug ip rip on your router console and see that 192.168.10.0 is being advertised to you with a metric of 16. What does this mean? What is difference between RIPng and RIP ? Explain the basic steps in RIP configuration ? If a RIP v2 router advertises its route, would it be received by all the devices on the network ? Can subnet mask information be stored in a RIP v1 packet? Which algorithm does RIP use ? RIP is denoted by which character/alphabet in Routing Table ? Which metric does RIP use ? Can RIP be a preferred Dynamic Routing protocol for large networks ? Explain the message types used in RIP ? If a RIP v2 router advertises it’s route, would it be received by all the devices on the network . Correct ? RIP is (Distance Vector Protocol / Path Vector Protocol / Link State / Routed protocol) ? What are features of RIP v2 ? Does RIPv2 send the entire routing table to all connected routers ? I have primary and secondary IP addresses configured on an Ethernet interface and my router is running RIP (a distance vector routing protocol). How does split-horizon affect the routing updates? What is concept of Routing by Rumor in RIP ? What is Route poisoning ? How does RIP v1 send Routing updates ? How does RIP v2 send Routing updates ?